Wendy Pearlman has studied or conducted research in Spain, Germany, Morocco, Egypt, Lebanon, Jordan, Turkey, Israel, and the West Bank and Gaza Strip. Wendy is the author of four books. The first, Occupied Voices: Stories of Everyday Life from the Second Intifada (Nation Books, 2003), was a Boston Globe and Washington Post bestseller. The second, Violence, Nonviolence, and the Palestinian National Movement (Cambridge University Press, 2011), was named one of Foreign Policy’s best books on the Middle East in 2011. 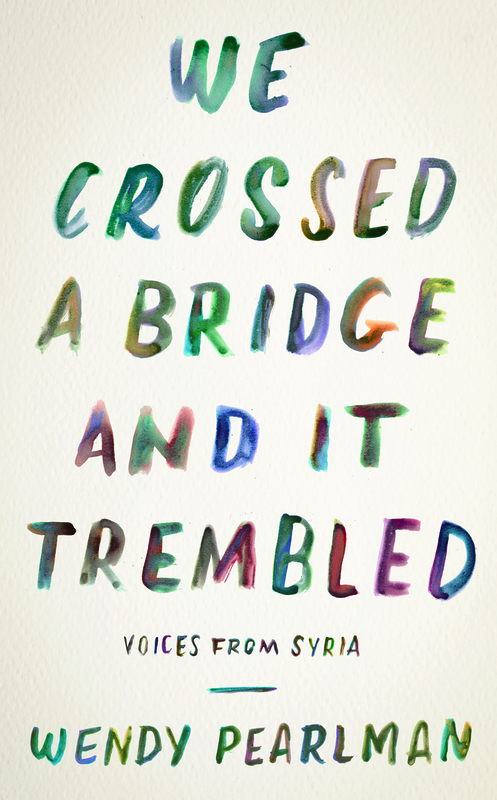 Wendy’s third book, We Crossed a Bridge and it Trembled: Voices from Syria (Custom House, 2017) is based on interviews that she has conducted from 2012 to the present with more than 400 displaced Syrians in Jordan, Turkey, Lebanon, the United Arab Emirates, Denmark, Sweden, Germany, and the United States. The book is a collection of first-hand testimonials that chronicles the Syrian rebellion, war, and refugee crisis exclusively through the stories and reflections of people who have lived it. Wendy has also pulled on this interview material to write articles on a range of topics, including political fear, protest cascades, transnational diffusion, and rebel fragmentation, among other topics. Her long-form narrative essays, Love in the Syrian Revolution and Fathers of Revolution, tell the stories of some of the extraordinary people whose stories she has collected. Wendy fourth book, co-authored with Boaz Atzili (American University), is Triadic Coercion: Israel’s Targeting of States That Host Nonstate Actors (Columbia University Press, 2018). It examines the causes and consequences of 70 years of Israel’s use of “triadic coercion”: the situation when a state uses violence and/or threats against another state to deter it from supporting a nonstate actor on its territory, or to compel that state to stop that nonstate actor. Wendy’s current book project returns to interviews with displaced Syrians, which she has continues to conduct. She plans to focus on the meaning of home, exile, belonging, and identify in a context of protracted war and indefinite displaced. As a recipient of the Alexander von Humboldt Foundation Research Fellowship for Experienced Researchers, Wendy is a fellow at EUME at the Forum Transregionale Studien in Berlin during the summers 2016-2018 and 2021-2022. Previously, Wendy was a Fulbright Scholar in Spain, a Starr Foundation Fellow at the Center for Arabic Studies Abroad at the American University in Cairo, a Junior Peace Fellow at the United States Institute of Peace, and a postdoctoral Fellow at the Belfer Center for Science and International Affairs at Harvard’s John F. Kennedy School of Government. Wendy has published articles in Arab Studies Journal, International Migration Review, International Security, Journal of Conflict Resolution, Journal of Palestine Studies, Middle East Law and Governance, Perspectives on Politics, Politics & Society, Security Studies, and Studies of Comparative International Development. She has been awarded the Weinberg College Distinguished Teaching Award and R. Barry Farrell Award for Excellence in Teaching, and has been elected to the Associated Student Government Faculty Honor Roll three times. She has won “best article” awards from the Moise A. Khayrallah Center for Lebanese Diaspora Studies and the Syrian Studies Association, as well as the 2011 Deborah Gerner Grant for Professional Development. “Moral Identity and Protest Cascades in Syria.” British Journal of Political Science, 48, no. 4 (October 2018), pp. 877-901. “From Palestine to Syria: Three Intifadas and lessons for popular struggles.” Middle East Law and Governance, 8 (2016), pp. 91-103. “Narratives of Fear in Syria.” Perspectives on Politics 14, no. 1 (March 2016), pp. 21-37. “Puzzles, Time, and Ethnographic Sensibilities: Research Methods after the Arab Spring.” Middle East Law and Governance 7 (2015), pp. 132-140. “Competing for Lebanon’s Diaspora: Transnationalism and Domestic Struggles in a Weak State.” International Migration Review, 48, no. 1 (Spring 2014), pp. 34-75. “Emotions and the Microfoundations of the Arab Uprisings.” Perspectives on Politics, 11, no. 2 (June 2013), pp. 387-409. “Emigration and Power: A Study of Sects in Lebanon, 1860-2010.” Politics & Society, 41, no. 1 (March 2013), pp. 102-133. “Triadic Deterrence” (with Boaz Atzili). Security Studies, 21, no. 2 (April-June 2012), pp. 301-335. “Precluding Nonviolence, Propelling Violence: The Effect of Internal Fragmentation on Movement Behavior.” Studies in Comparative International Development, 47, no. 1 (March 2012), pp. 23-46. “Nonstate actors, fragmentation, and conflict processes” (with Kathleen Gallagher Cunningham). Introduction to special issue. Journal of Conflict Resolution, 56, no. 1 (February 2012), pp. 3-15. “The Palestinian national movement and the 1967 War” in Wm Roger Louis and Avi Shlaim, eds., The 1967 Arab-Israeli War: Origins and Consequences (Cambridge: Cambridge University Press, 2012), pp. 126-148. “Spoiling Inside and Out: Internal Political Contestation and the Middle East Peace Process” International Security, 33, no. 3 (Winter 2008/09), pp. 79-109. “Struggle in a Post-Charisma Transition: Rethinking Palestinian Politics after Arafat” (with Ali Jarbawi). Journal of Palestine Studies, 36, no. 4 (Summer 2007), pp. 6-21.